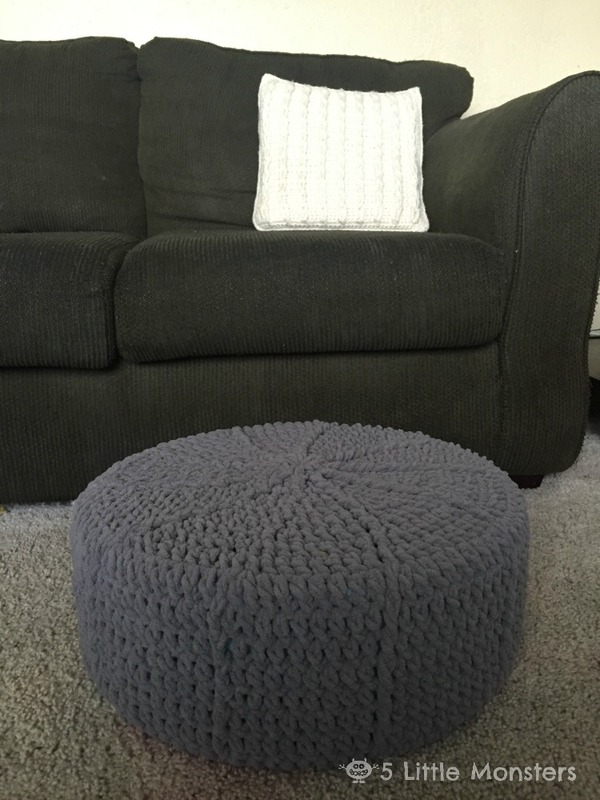 Fairfield World recently challenged all of their Master Makers to make a pouf using their new round foam tuffet. 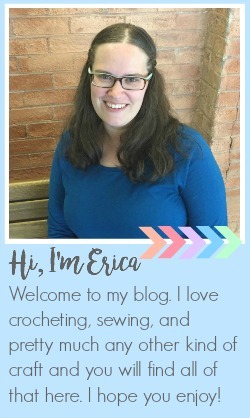 I right away knew that I wanted to crochet mine. 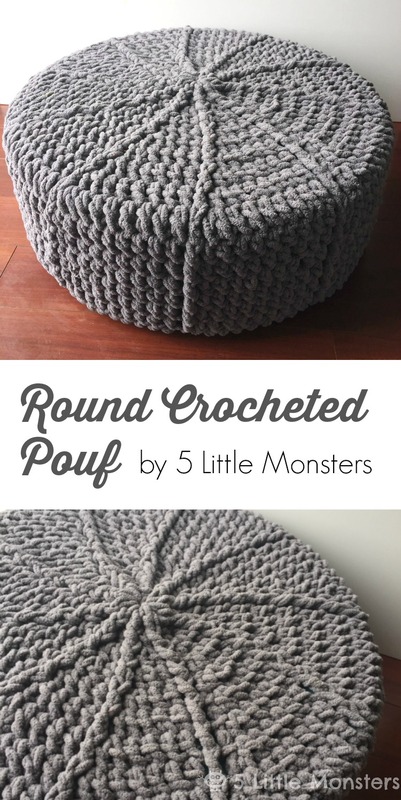 I have seen lots of crocheted poufs different places so I kind of had an idea in my mind of what I wanted my pouf to look like. 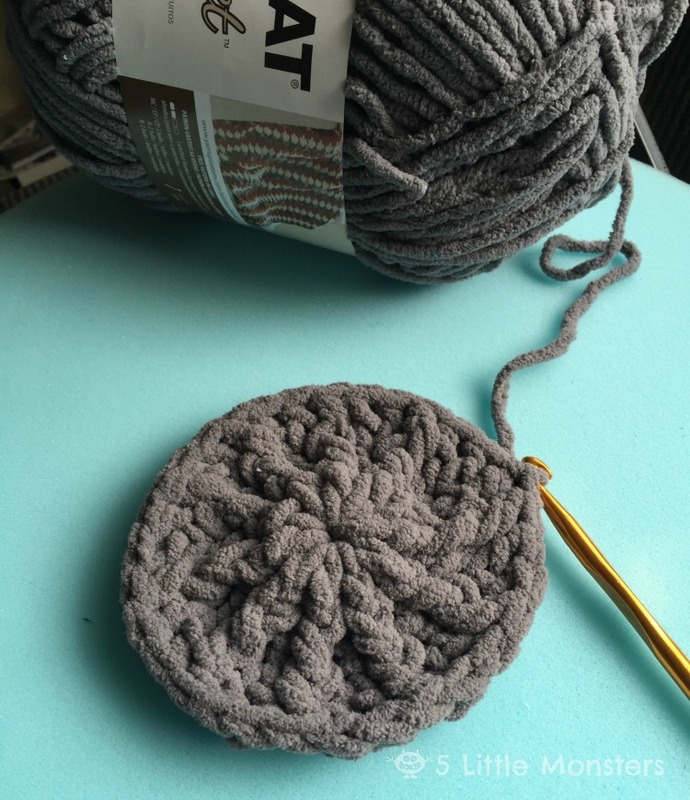 I wanted to use a really thick, bulky yarn so I looked around for a while trying to find a bulky yarn that I thought would work best. I decided on Bernat Blanket because I felt like not only did it have the bulkiness I was looking for, it also was a good price. I bought the giant balls at JoAnn and especially using a coupon it seemed like the most affordable option for a bulky yarn. I ended up using about 1 1/2 of the big balls. 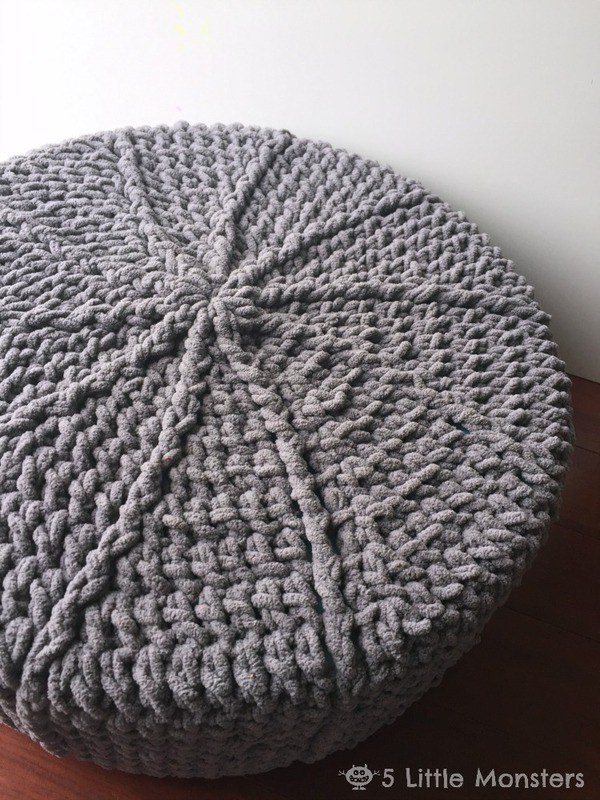 I haven't done a bulky yarn project for a while and it was kind of nice because with the thick yarn and a large hook it worked up really fast. 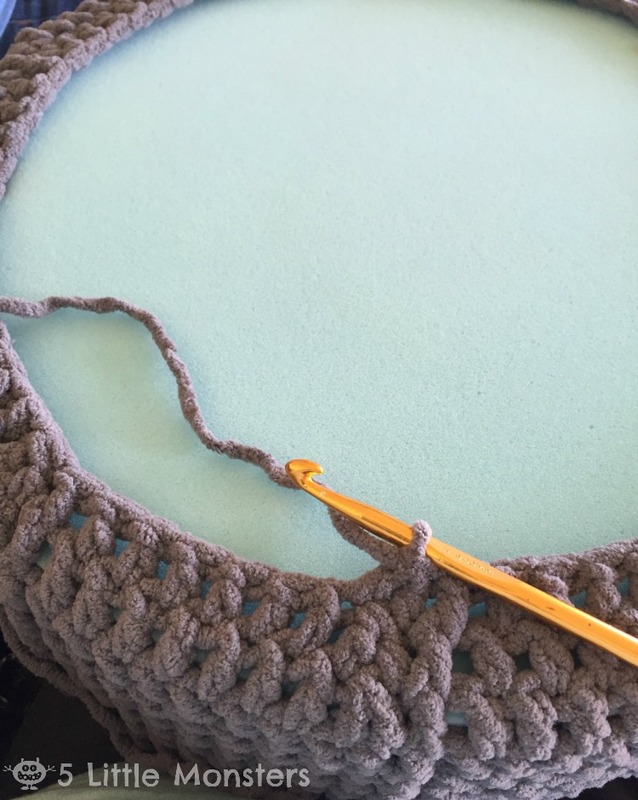 For my stitch pattern I just did double crochets in the round but I added in some post stitches to give a little texture. One thing I was a little nervous about was whether or not you would be able to see the foam through the crochet. 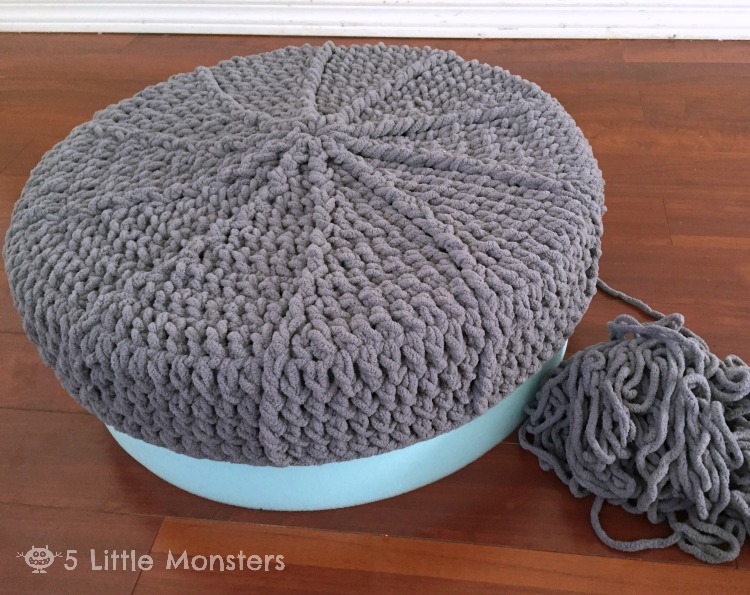 The foam tuffet is green and I was using dark gray yarn and I really didn't want to see green through it. I considered covering the foam with fabric first and obviously that is an option, but I ended up deciding not to and just hoped it would be ok. What I found is that for the most part the crochet is tight enough to cover it up. Maybe if you crochet a little looser than me it might be more of an issue but mine worked out pretty well. At least on the top. The bottom was kind of a different story. The only place that you could kind of see through a little on the top was where I joined my rounds because I think the stitches always seem to have a slightly bigger gap in that spot. I always feel like when I am working decreases the gaps are always a little bigger than when I work increases. I find the same thing happens when I am making amigurumi, you can always see a little bit of stuffing poking through where my decreases are. As a result, if you flip the cushion over you can definitely see more little spots of green poking through between the stitches, especially where the decreases are. Since that is the bottom of my cushion I didn't worry too much about it because I figured once it is set on the ground no one will really notice. If you are worried about that you may want to cover yours first. Since I chose not to do that I don't have instructions on how, I just have the how to for the crocheted part. 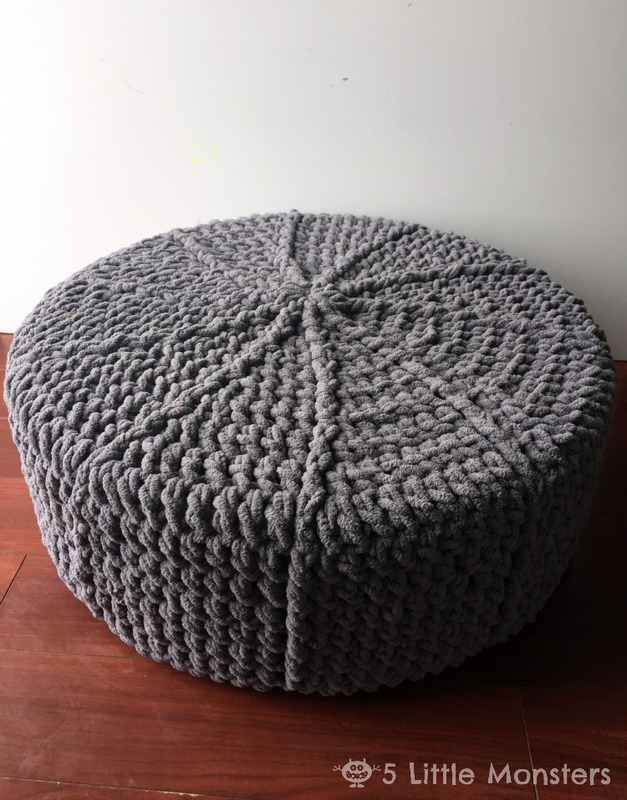 Pull the cover over the tuffet, it should fit over the top and down the sides, now you will start working around the bottom and decreasing with the foam inside.